It’s been almost 6 weeks since our baby Levy was born but I figured it's better to share my experience late than never. I hope it might be helpful to anyone who is on the fence (like we were) regarding hiring a doula. Our family couldn’t be more grateful to the amazing Tara Gomez for the birth experience we had! We were planning to attempt an unmedicated birth and after some deliberation decided that we wouldn’t need a doula, since my mom was going to be there to help. Luckily, Bethany convinced me to reconsider. Less than 30 hours before my waters broke we hired Tara “just in case” things didn’t go as we expected. Best decision ever! - it turned out we simply didn’t know what to expect. We had taken a wonderful birth prep class with Heather Ward and understood different stages of labor, but the intensity of the pain and the overall experience caught us by surprise. Also as we learned you cannot really rely on nurses’ help - some of them were just fantastic but more often than not we were disappointed. This is where Tara’s expertise became so important. My best guess is that without her I would get an epidural fairly early on and I have no idea (and don’t really want to know) how that would impact my experience. In addition having more than one set of hands is very helpful since the job of the birth partner among other things is extremely demanding physically. So here is my story. My waters broke around 6pm on July 17 – we were at a salon near our house and Alex was half-way though a haircut :) We went to the hospital promptly since I was GBS positive and had to get antibiotics. I was really bummed about having an IV in the beginning – but I couldn’t care less about it just a few hours later. After I was connected to the monitors I realized that the occasional cramp-like pain in my back was actually early contractions. We hung out bored and sleepy until a little after midnight, at which point I was given pitocin. We started watching an episode of Seinfeld but within an hour my contractions really picked up – it was the same lower back pain but it was getting very intense and I had to move to my hands and knees to the floor. Alex was massaging my back and I was moaning through contractions and sort of passing out in between - I would say “sleeping” but it wouldn’t be the right word to use given the amount of pain I was in. I wasn't feeling nauseous but threw up several times - I think my body was trying to clear itself of the dinner I had before going to the hospital. Sometime around 3am I told Alex to call Tara. He hesitated at first because he was worried she would “break the rhythm” we had going but after a few minutes I realized the pain was getting out of hand and convinced him to call. Tara arrived shortly; she walked in dropped her bag and immediately took over massaging my back, which was very relieving even though Alex had been doing a great job up to that point. It’s hard for me to reconstruct the exact course of events but then Tara moved me to the toilet, where I sat leaning on lots of pillows, and then maybe to the bed on my hands and knees – that took couple of hours. Then we moved to the shower where in my mind we spent most of the time. When was first walked into the shower and Tara told me to sit on the birthing ball covered by towels in the tub – and all I wanted to do at that point was being on my hands and knees! – I didn’t think I could do it but I didn’t argue. The moment I sat down on the ball, Tara started doing figure 8 on my lower back with hot water and that was the greatest relief imaginable – yay! We ended up spending at least couple of hours in the shower. I had my head leaning on a pillow against the wall, while Alex, Tara, and my mom (she arrived at some point during that time) were doing water massage on my back, holding my hand, breathing with me, etc. I didn’t know who was where (they were switching) but there were always at least 2 pairs of hands massaging me and I could focus completely on breathing/moaning through my contractions. The baby was posterior for most of the labor and so my contractions were coming in pairs. In addition (as I was told later) the pitocin was causing them to be very close apart. Eventually my back pain became so intense even between contractions that I could no longer breathe through them. I thought that since I would need energy for pushing later maybe epidural could be a good move. Well, it was easy to think, but it took me a few contractions to gather up energy to say “maybe we should reconsider that epidural” to Tara, who happened to be sitting in front of me at the time. She said “You are really getting there” (or something to that extent) and encouraged me to keep going. I did not believe her, but I had no energy to argue and decided to just trust her. Plus I knew we were planning on getting out of the shower shortly to finally check my dilation. When we did, it was after 6am (I didn’t want to know how long it had been by happened to see a clock) and I turned out to be 5-6cm dilated. “No way!” I thought. But again – not like I had much choice other than to proceed. Jumping a little ahead I will say that everything went really fast in my mind from that point on. Alex said it was “second breath” for both me and him; turned out he was passing out from being tired - but holding up and helping me tremendously - ever since Tara came. At this point nothing was really helping my pain any more – my back was killing me during and between contractions, so I knew when a new one started but I no longer knew when it ended. There was a lot of effort put into easing my pain but the main focus was on turning the baby around for the final push. Tara lead a series of poses – rocking me on my side, standing next to the bed hanging on Alex with one leg on the bed, etc. Jumping ahead again – coupled with Bethany’s “magic” towards the end, it worked and Levy came out facing the right way. Eventually (I’m guessing some time closer to 8), I started feeling the urge to push, so Tara moved me to the toilet once again to practice pushing. At that point (around 8:10 I’m told) Bethany arrived – things were progressing faster than anticipated. We moved back to the bed, and I started pushing. Alex was pushing with me holding up my leg and pressing on my forehead. My mom and our amazing nurse Sue who joined the team a couple of hours before that were giving me massages (I think) – so again, it was a team effort. I almost enjoyed pushing because it was the only thing that was giving me short relief from my back pain. I tried really hard to just push through the burning I was feeling and Levy was born just a few minutes later at 8:50am! The funny thing is I did not even realize he was out when it happened – I could not slow down and he squeezed out on one push, instead of the usual, head first, shoulders later. The speed was probably a good thing because Levy had umbilical cord around his neck 3 times and was all grey. Alex who was catching him says it was horrifying. However, luckily the cord was long enough and the baby cried and was placed on my chest immediately. I could not believe I was done!!! Our family couldn’t be more grateful to the amazing Tara Gomez for the birth experience we had! "When you hear about someones God-given abilities, you know their gift is special. 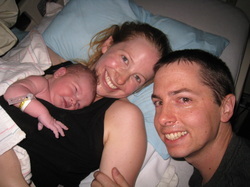 When I delivered my son naturally with Tara's gift, I realized that Tara was no ordinary doula. Not only did I have a needle-free birth (which was my wish), my labor and delivery experiences were amazing. Tara not only supported me mentally and emotionally as my doula, she helped me physically through the contractions. She is very knowledgeable about the facts of birth, but it's during the actual birth process that counts. Tara kept me focused during delivery so I could stay 'in the zone', and she also coached my husband so we both experienced the special event together. I couldn't have asked for anything more! If you desire the best, you better get on her calendar!!!" She also coached my husband so we both experienced the special event together. "I cannot say enough wonderful things about Tara. She is a fantastic doula and helped me have the completely natural birth that I always wanted. Tara came over right away when we called her close to midnight, and she tirelessly massaged, positioned, and coached me through 12+ hours of labor and delivery. Tara knew exactly when to go to the hospital--without her we would have gone way too early and potentially slowed down the labor. What's funny is my husband was reluctant to hire a doula at first, but now he says that he is sooo glad we hired Tara and that we couldn't have done it without her! Tara has a very sweet and loving personality, perfect for this line of work. She also has given birth to five lovely children, so can relate to everything that her "mamas" are going through. She's the best, thanks, Tara!" She ... helped me have the completely natural birth that I always wanted. Tara came highly recommended from a midwife and a birth class instructor, so we knew before we even met her that she would be a wise choice for a doula. After meeting her the first time, we were even more certain. We found that we instantly trusted her and were put at ease due to her warm and caring demeanor. Over the course of our two prenatal visits with Tara, we enjoyed connecting with her as we discussed our hopes and goals. "She was very encouraging and responsive to the questions I had leading up to labor, and she provided amazing phone support when labor actually began." When she arrived at our home during labor in the middle of the night, I felt so relaxed knowing that I could trust her guidance. She helped me to breathe and relax properly, suggested other positions to try, and massaged my aching muscles. Tara also helped us get to the hospital at just the right time for us. I had wanted to do the majority of my laboring at home, so when I arrived at the hospital and they told me I was 8 centimeters dilated, I was thrilled. She helped make the hospital environment feel more comfortable and instructed me through transition and pushing in clear ways that I could understand. "Most valuable of all, she drew my husband and I closer together and helped support him in his very important role." I really don't believe we could have asked for a better birth experience and I know Tara was an integral part of that. She was also very encouraging in the weeks after our daughter was born when we were learning all about the challenges of breastfeeding and newborns. She took a ton of photos during and after the birth process, but I think this one captures the experience best. I am alert, elated, and strong, and my husband is overtaken by the beauty of the moment. "Most valuable of all, she drew my husband and I closer together and helped support him in his very important role."